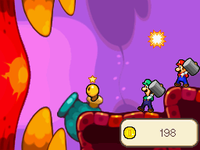 The Arm Center is a location inside Bowser's body in Mario & Luigi: Bowser's Inside Story. It is located in Bowser's right arm. Mario and Luigi go here to stimulate the muscles, causing an increase in strength over Bowser's arms which allows him to perform different tasks, making the story able to progress. 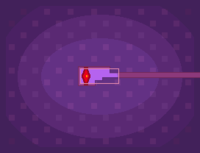 This area is visited four times, and the minigame it features gets harder and faster as the player progresses. The minigame requires Mario and Luigi to hit balls of light back at the muscles of Bowser's arm. The balls are shot from the small cannon at the base of the muscle. If the ball is red, Mario must hit it with his hammer; if it's green, then it's up to Luigi. If the bros. miss a ball, they lose coins. Bowser is traveling around Plack Beach. Just then, he hears a voice. The voice turns out to be Broque Monsieur. He asks Bowser to pull on a rope connected to the island because the bridge collapsed and fell into the ocean. When Bowser refuses to help, Broque Monsieur offers him a Vacuum Block, with the promise that it will bring surprises. Convinced, Bowser pulls on the rope. After help from Mario and Luigi, Bowser successfully pulls on the island, connecting it to the rest of Plack Beach. While walking through Dimble Wood for the first time, Bowser sees some of his Goombas locked in a cage, across a river. He looks around for something to use as a bridge, and finds a very large Wiggler statue. With Mario and Luigi's help, Bowser lifts the statue into the air, and hurls it across the river, creating a bridge. After meeting up with some of his minions, Private Goomp, Corporal Paraplonk, and Sergeant Guy, he finds that they have a Cannon. Initially happy that they came up with a plan, he grows upset, as they forgot a Banzai Bill to load it with. When he sends them off to find one, Starlow tells him that he should find one and that they did not seem too reliable. After some traveling, he finds a garden managed by Wigglers. Searching around, he finds a large carrot. Deciding it would work just as well as a Banzai Bill, he begins to pull it out. Mario and Luigi travel to the Arm Center and help Bowser pull it out. While traveling to his castle, Bowser finds that it is floating in the air, thanks to Midbus. Midbus decides to fire a giant iron ball, which flies over to Bowser. Luckily for Bowser, rather than flattening him, he manages to hold the ball in his arms, over his head. Going again to the Arm Center for the fourth and final time, Mario and Luigi manage to boost his arm muscles enough for him to toss it at the castle, and have Midbus put the castle it back where it was. This page was last edited on December 12, 2018, at 02:06.